Dean Russell maintained his nine-point lead after the pre-Christmas session of the Wednesday Junior League at Waterlooville Sports Bar, writes Tim Dunkley. The 16-year-old, who was runner-up in the previous two seasons, heads top-group winner Jamie Wilson. Defending champion Samuel Laxton, Zak Truscott and Lewis Wilson are two points further back. The much-improved Owen Jenkins, nine, was undefeated in the second group and climbed to third in division two. Henry Martin won the third group and moves into the second tier. All of the lads went home with selection boxes courtesy of club owners Suzy and Steve Wilson. Meanwhile, Jamie Wilson took over top spot on frames won from his brother Lewis in the Monday Junior League. That competition resumes on January 8 but the Wednesday battles continue throughout the holiday period. Elsewhere, Jamie Wilson kept up his excellent record of qualifying for knockouts as he reached the quarter-finals of the fourth leg of the EASB Regional Junior Tour South at the Castle SC, Brighton. 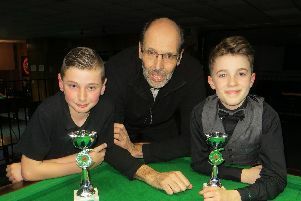 The 14-year-old, who won the third leg and is fourth in the rankings, was beaten 2-1 by eventual winner Steven Hughes. Wilson has now progressed through the group stages in 10 out of 11 tournaments on the EASB and Cuestars circuits this season. Fareham’s Glenn Gresham finished third in his round-robin group in the fourth leg of the Cuestars South of England Seniors Tour. Gresham, the region’s only entry, won two of his four matches at Cue T’s Social & Snooker Lounge, Marchwood.